As I type it's easy to find articles concerning the current stock market, the 'Trump Rally' some call it, which is a bubble of over-evaluation that the US stock market is floating around in, a bubble made to feel right at home thanks to the natal horoscope of the NYSE (1792) with its inflationary speculator pair of Jupiter conjunct Neptune in Libra. So the NYSE is in process of a Jupiter Return as well! 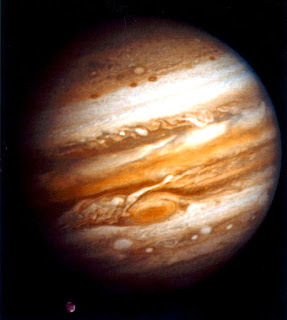 Natal Jupiter @22Lib57 Rx; natal Neptune @27Lib42 Rx). Here's a good article on the Trump Rally and the DOW's bubble if you're curious. No financial astrologer am I but it is interesting that the Saturn-Uranus pair--the first planet, restrictive, sober, and cautious, the second, progressive, freedom-loving, and futuristic--when blending their energies together in the realms of Economics tends to create "sharp swings before settling on a new track," says expert astrologer Marjorie Orr. What goes up must come down and even Wall Street gentry can't change natural laws. So all this has inspired me to look at the last (current) conjunction/s of Saturn and Uranus which occur approximately every 45 years, and compare it with transit Saturn's 2017 position here in the first year of Mr. Trump who has recently touted his so-called "Trump Rally" on Wall Street. Yes, Jupiterians tend to take credit where it isn't due. And since he's known for his attraction to gambling casinos, it seems appropriate to include him in this consideration since Wall Street is a gambling casino. So the three 1988 Saturn-Uranus conjunctions fell in the range of 27 to 30 degrees of Jupiter-ruled Sagittarius and what seems significant is that transit Saturn is in process of returning to those three degree positions. Further focus may be found in the horoscope (pictured, below) of Saturn's April 6, 2017 Retrograde Station @27Sag47:29 whic casts a spotlight on the third of the three Saturn-Uranus conjunctions which occurred on October 18, 1988 (with a 2-minute orb). 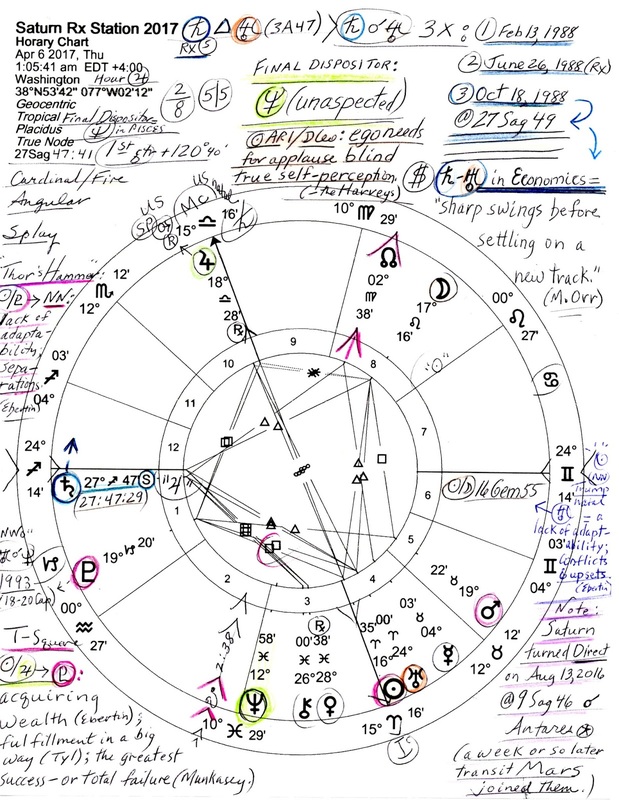 For as you know, stationing planets increase in strength, here is transit Saturn retracing and highlighting its own path at the beginning of the current Saturn-Uranus cycle, and there's a shady "Trump Rally" going on in markets. 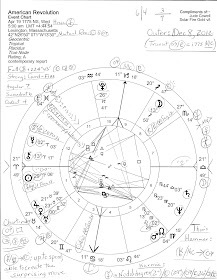 Now everyone knows that a Saturn Return is a time of accountability--of confronting past failures, correcting mistakes, and ending situations and alliances that prevent future growth. 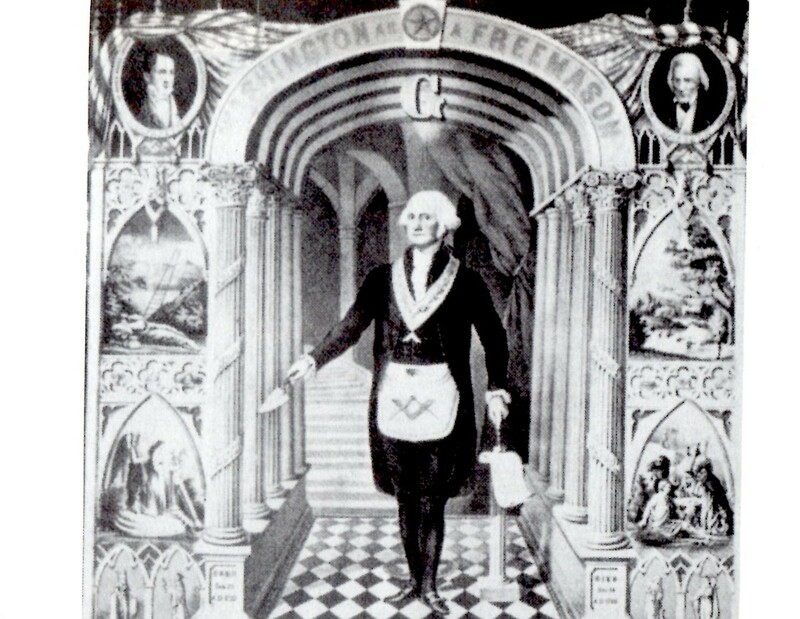 This is made more necessary by the fact that Saturn is now passing through the NYSE's 4th house, a time of Atonement. Of course, it may be that re-commitment is in order though I suspect that a finalizing period would be more likely considering the Exchange's lack of transparency. Remember when transit Saturn hit and crossed the IC (The Ending; The Drain) of the 4th house (IC @28Sco19) and resulted in the strange episode of July 8, 2015 when trading was suddenly and mysteriously halted due to an "internal technology issue" which "prompted the halt"? If memory serves, the poorly explained shutdown of the DOW lasted from 11:32 am edt to 2:45 pm or so. That was Saturn shutting down the proceedings allegedly due to technology issues of techie planet of and electricity, Uranus. , and the SEC fining Drexel, to name a few. Sports and entertainment events are listed as well and of course Donald Trump turns up as well: on July 11, 1988 Mike Tyson hired Mr. Trump as "an advisor." Then on October 26, 1988, Trump presents Tyson with a $2 million bill for 4 months' worth of advisory service. Somewhere between those dates Mr. Tyson smashed a TV camera but it isn't listed whether that little PR stunt was staged on the sage advice of Mr. Trump (aka, John Miller, the mysterious PR guy). 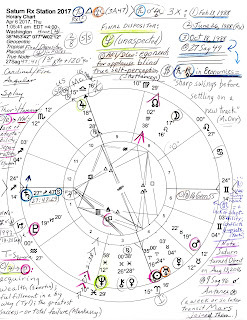 Pictured above is the Saturn Rx Station horoscope of April 6, 2017 (Washington DC) placing a cosmic emphasis on their cyclic dance which began in 1988 and showing that Saturn and Uranus have reached a harmonious trine (120 degrees) phase of received benefits for groups and organizations if not for one's personal finances. However, lower interest rates are suggested by the trine and tax breaks for certain classes are 'in the air'. Money bags financier and politician Jupiter is Angular and on display upon the world stage but with the opposing Sun at IC (their opposition a time of all show, no substance) and something quirky or untoward is afoot with the Sun approaching radical Uranus (24Ari00) in the 4th house of Real Estate, Mining, etc (with this chart set for Washington DC I continue to 'think Trump' here). Note: see lower left for the T-Square's midpoint picture between Sun-Jupiter and apex Pluto, a large scale enterprise trio. Predictably, manipulation is possible for very few people during this time for only those favored with the widest vision may see far enough ahead and behind to take correct or corrective action. 'Those' such as the wealthy, stealthy first house Pluto in Capricorn which is, as you see, intercepted. This hints that something hidden and karmic is involved in the current bubbly affair that Mr. Trump has taken credit for (when he isn't disparaging it)--possibly in a breakdown mode to ready for plutonian transformation. But there's always karma's natural law of reaping what's been sown which can apply to stock markets in general, now that I think about it, although gamblers always tend to want large gains for little effort, no matter the scale of their endeavors. Don't miss Politico's Trump's 'big fat bubble' trouble in the stock market. Now because of Saturn's upcoming retrograde period (the very moment of his directional shift you see before you in this horoscope), the latest degree of the Saturn-Uranus conjunction/s is 29Sag55 on February 13, 1988, a critical-crisis 29th degree--but it won't be reached until around December 20, 2017--just prior to transit Saturn eagerly entering its own sign of Capricorn. And as you may know, heavy, cold Saturn when in barrier-loving Capricorn does not tend to favor markets. So let's see as 2017 comes to a close if Mr. Trump takes the credit--or the Saturnian blame--for that. Related: a quirky Uranian-in-Chief have we in The Whimsical Sun (POTUS) of Inauguration 2017.